Disclosure: I was provided with these accessories from Oriental Trading free of charge in exchange for my fair and honest review. Please see my disclosure policy. This post also contains affiliate links, which means that at no extra cost to you I can make a tiny bit of money to help support this blog. Thank you! Does your child love Minecraft?!?!? My son is OBSESSED with it, and I know that others are too. So if you’re thinking of hosting a Minecraft-themed party, here’s some fantastic inspiration for you! Firstly – costumes! My son LOVES this Steve costume, but Oriental Trading also have Armor, Creeper, and Alex costumes, all available in two sizes. And if you want to provide something for the other kids at the party (especially those that don’t want to wear a full costume), then get some pixel bandanas – they will definitely come in useful! Are you having food at the party? Combine colors to create the Minecraft look: bright green napkins with brown plates to look like a grass block, or bright blue and dark blue for that diamond look. This trick worked really well for my son’s Nerf party and you don’t have to have expensive branded tableware that will just go in the trash! Oriental Trading has SO many options to choose from! How about arranging some activities at the party? 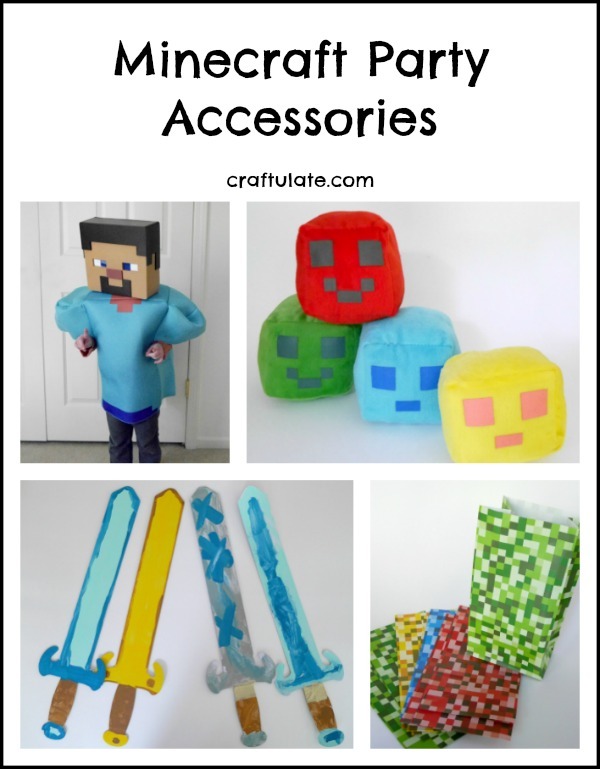 If you want to have the kids running around creating battles but staying safe, get them all inflatable pickaxes or swords – they can even take them home afterwards! Or if you’re looking for something quieter, try filling some fun potion bottles, or getting everyone to decorate their own card sword. And let’s not forget the party favor bags! I *love* these colorful pixel bags. Need some ideas for filling them? Oriental Trading has pixel-themed playing cards, tattoos, building blocks and more – all at great prices! And everyone will love these Plush Pixel Pals (and they’re bigger than they look)! !